Let us start by saying we value freedom of movement and privacy above most other factors. 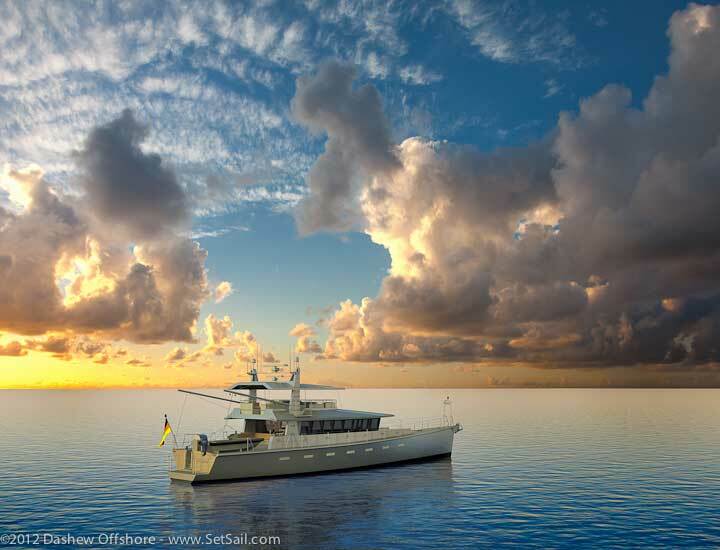 So committing to another person on board, even with a yacht as big as the FPB 97, would have to bring major benefits. And we’d want to be sure that, if things did not work out, there would be the option of going it alone if we so desired. We’ll start with the easy issues first. Being on passage as a couple is not only easier than most folks think, it is also one of the parts of cruising we love the most. There is no other comparable activity we have found that allows us to enjoy working together as a team like this, with little non-essential outside stimuli. It is just us, the boat, and the sea. 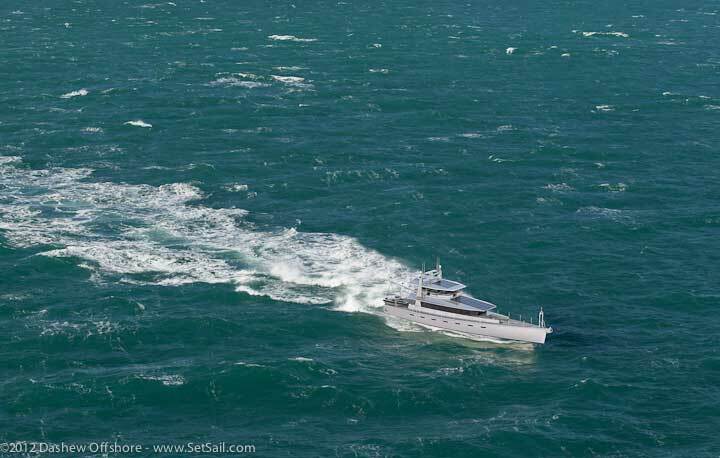 If the yacht is set up correctly for short-handed voyaging – and we’ll get into this in a minute – the work load is minimal, the watch standing enjoyable, all of which is taking place in a level of comfort we would not have believed possible seven years ago. Having the boat to ourselves, with no need to consider anyone else’s needs or schedules, eating what we want and when we want, wearing (or not wearing) whatever takes our fancy, with a quiet peace in which to enjoy each other’s company, is a heady combination. There is a price to be paid, and that is sleep. We stand watch at night, three hours on and three off. During the day things are more informal. The first two days of a passage are the hardest as our bodies adjust to the new pattern. By day four we are in the groove. By day six the pattern is ingrained and we could go on for a month. There must be a comfortable bunk for the off watch so that sleep does occur. Interior layout has to encourage easy communication between the watch stander and the off watch (this was the genesis of the great room concept keeping all functions within one area). If the watch stander desires a drink or snack, they have to be able to take care of this while maintaining situational awareness. There must be somewhere close to the con where the off watch can sleep when navigational or traffic considerations may warrant a second opinion. Sight lines from the helm and galley must be such that an eye can be kept in all directions by the watch stander. Systems need to be reliable, redundant, easily maintained, with a layout and set of manuals that encourages both members of the couple to get involved in running the boat. The FPB 64 and 83 both have their great room as command and social center. The FPB 97 has the primary command center removed to the Matrix deck. When offshore the second helm in the great room will see significant usage. 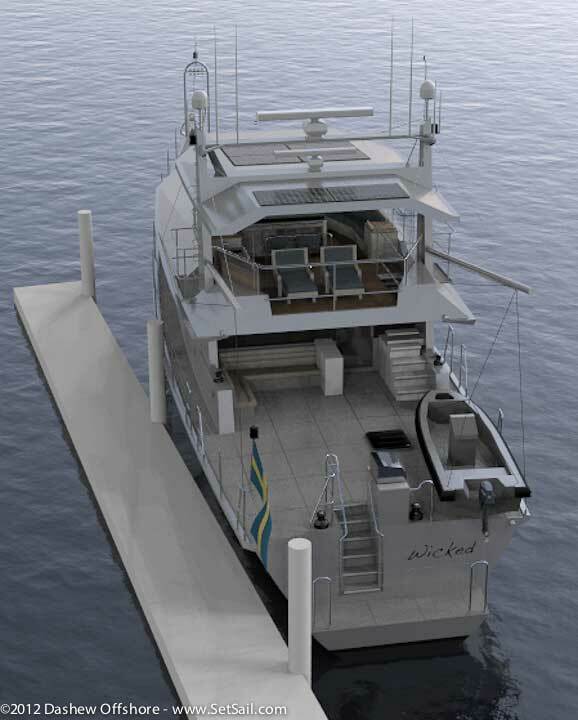 This gives the option of using either the Matrix deck or the great room for keeping watch as inclination and conditions dictate (both have somewhere for the off watch to sleep nearby the helm). With coastal cruising you trade short hops–probably day trips, with typically more intense navigation and lookout–for that missing sleep on long passages. While you can relax offshore, this is never the case when there is traffic or a navigational issue about which to be concerned. Still, as long as you have the speed to make respectable daylight jumps, and an efficient nav station arranged to facilitate piloting in difficult conditions, crew is not a prerequisite for us. Speed is an important part of this equation. 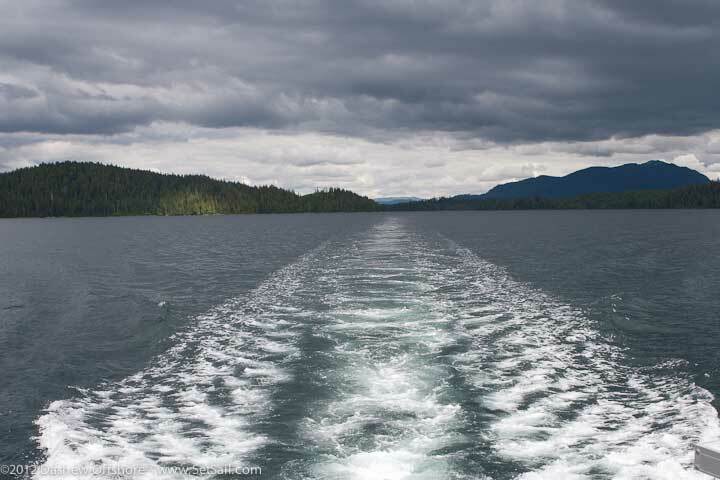 With an easy 12 knot coastal passaging speed, if you are heading north toward Alaska on the Inside Passage, or cruising Norway, 160 to 180 mile day trips are not a problem in the long high latitude summer days. Yes, that’s a long day at the helm. But there are two of you, you can spell one another occasionally, and when the hook is finally set for the night, if you like the spot, the previous day’s mileage allows you to relax for a day or two. Since we design for living at anchor, there is no need to stop at marinas, with their noise, crowds, docking issues, and requirement to make reservations in advance. Our preference is to find a quiet spot and lie to our own anchor. And it is a lot less work to push a button and anchor than to dig out the dock lines and fenders. If there is a case to be made for extra hands, it is going to be when docking the boat. However, with the right system of dock lines, winches, and vessel control, we don’t see that there is any major difference between docking an FPB 64 or FPB 97 with two people. But things have to be done right. Number one is a vessel which handles in a predictable, controlled fashion. The quicker and more reliable the response, the tighter the situation into which you can insert yourself. Equally important are the lines of sight from the helm to the bow, stern, and side. With just two folks aboard, the line handler needs to concentrate on his/her job and the skipper has to see well enough to make his/her own judgement calls on distance. You need a system of light but strong high modulus dock lines, pre-rigged before going into the marina area. An array of self-tailing electric winches for securing and adjusting dock lines with remote control at the main helm round out this list. The FPB 97 has larger rudders and more prop wash relative to its size than the FPB 83, so we expect even greater precision control. There is a bow thruster (Wind Horse has none). There are six electric self-tailing winches for docking. Wind Horse has just one. The outboard docking platform gives wonderful lines of sight. The bottom line to all this is a yacht that can be docked in most cases by an experienced couple just as or more easily than the FPB 83 Wind Horse. And if space, currents, or wind makes a short-handed positive outcome challenging? Then pick someone up locally to help. Survey the situation. Take the dink ashore and have a water-born and land-based look around. Pre-rig dock lines and fenders. Double check booms are inboard. Arrange with marina to have someone on hand to take a line. Review actions to be taken with dock lines. Order how they get secured (usually breast line first). Have a backup plan if things do not work out as expected. Verify that winches, engine controls, pilot, and thruster are all engaged and operating. In most cases we simply want to get a single breast line secured on the dock. Once this is done, we can winch the boat sideways, using an electric winch controlled from the helm. If the wind or current is favoring a certain direction, the breast line will be biased in that direction, so it automatically snugs the boat up parallel to the dock. Crew stands on swim step, holding either breast line or stern spring line. FPB 97 is positioned a boat’s width off dock, or closer if there is space. Stern is rotated into dock and crew steps off using either bow thruster or the engines depending on wind and current. In the image above and below you can see how the flared topsides coupled with tapered waterlines makes it easy to simply rotate the boarding platform onto the dock. The same feature works for you when coming alongside. You can literally drop the breast line to someone on the dock from the deck, rather than having to scale sideways. Keep in mind that you are just as comfortable at anchor as in a marina, so if the docking scenario seems difficult, the answer is to anchor out. Now things get more challenging. Med mooring crowded harbors, possibly squeezing into a space not large enough, almost certainly with a crosswind, and of course, numerous bored onlookers waiting for a good laugh. If you are going to want extra hands, this is where they will be needed. But as we found in our recent visit to the Balearic Islands, you can always ask for help from the marina staff. 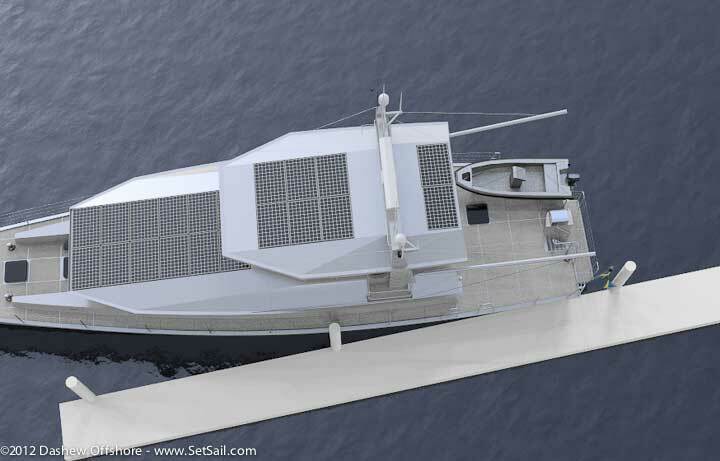 This not so much a vessel size issue as one of hull shape, maneuverability, and deck gear. The FPB 97 has several advantages in this regard. Its moderate stern beam (compared to most yachts which carry their max beam to the stern) slips much more easily into the too-small space. Less aim and angle is required as a result. There are a pair of powered electric winches aft and forward for use with the twin stern lines and twin anchor bow lines. You have excellent visibility forward and aft from the helm, and down the sides (from the maneuvering platform). There is firm and precise control from the over-sized rudders and counter-rotating props. Survey harbor and docking situation first, then withdraw to finish rigging fenders and stern lines. Position off dock with allowance for wind and current. If tight, pick a time, usually early in the day, when breeze is lightest. Drop back with light touches in reverse (in and out of gear), steering with the engines. Adjust to port using the starboard engine in reverse or the port engine to move the stern to starboard. Rudders are on center. The ability to stop instantly with a touch of throttle allows you to get close enough for a gentle throw of the stern line. The marina crew will then hand the first anchor line across. This is walked forward (or the marina crew will do this for you). The boat is then captured between bow and stern, both on electric winches. Secure second stern line, then second anchor, and adjust all four from the bridge with the remote control electric winches. Although this sounds complex, and is intimidating the first time you do it, by the fifth or sixth equence it will be routine. Does Med mooring make permanent crew a requirement? We’d say no, although extra help will be needed from time to time. If there is one operation that is going to demand an extra crew member, it is using shore fasts (securing the boat to trees, rocks, or anchor bolts ashore in tiny anchorages). When conditions are benign, say a tropical island where you take a line ashore to a coconut tree, then it can be accomplished by a couple, if things are properly set up. But shore fasts are usually thought of in the context of places like Tierra del Fuego (near Cape Horn), or Greenland, with cold water, fast work, and unpleasant complications if things do not go according to plan. This is an environment where it pays to think seriously about a younger, more damage tolerant, and fit extra body on board. Then there is the question of size of vessel. How do you handle a 97 footer in this environment, even with an extra crew member(s) aboard? Over-sized ground tackle, putting the weight of two anchors into a single hook, where it is working all of the time, means shore fasts are required less often. Having those two big rudders, counter-rotating props, and moderate windage relative to their maneuvering force, means you have far more control over the situation than is the case in many other yachts. There are four shore fast reels each with 200m (670 feet) of high modulus rope are set up for fast run out and retrieval. These lines are then lead to one of the six electric deck winches. We should point out that, although we carry shore fasts on Wind Horse, we have yet to need them in Newfoundland, Labrador, Greenland, Norway, or Svalbard. That massively over-sized anchor on the bow is the reason. Although launch and retrieval of the dinghy is a multi-handed enterprise on some yachts, we have not found this to be the case with our boom system. Launching can easily be accomplished by a single person. Until now we have always needed both of us to get the dink back aboard. With the new system developed for the FPB 97, in many cases we can see a single person bringing the dinghy back aboard. Dragging a big dinghy onto the beach is another story, which is why we carry our big power dink, and then a second, much lighter (1/4 the weight) rowing dinghy. The FPB 97 has room for two really nice dinghies on the after deck, so we think we are covered for the beach excursions..
We divide maintenance into several categories. First, what the yacht requires for proper operation. With the exception of cleaning the props, the rest of the maintenance is not that much different than the FPB64, with the addition of a second engine which requires periodic checks and oil changes. Windows must be maintained for visibility and there are more of them. However, these windows are higher, and because they are outside the mullions, much easier to clean than the smaller boats. Cleaning the outside is a simple hose-off. Nothing else is required. So, although the boat has a lot of surface, this is relatively quick and painless. The interior is another story. You can spend a lot of time wiping down the furniture, cabin soles, engine room surfaces, and then vacuuming. Enough to warrant crew? Not by itself. But we do have to plan in advance where to leave the boat, and crew would give us the freedom to step off virtually anywhere. When we left Wind Horse at Berthon’s in the UK for two winters, we became addicted to their “valet” service. We told them when we’d be coming back, and would arrive to a freshly power-washed, polished stainless, windows cleaned, interior vacuumed and wiped down boat. Very nice. Then comes provisioning. That can be a large or small project. What we have learned to do is find one or two markets with the types of things we like, talk to the manager about an order for six months of stores, and then have them assign a helper for the ordering process. We walk down the isles, making a list with them, and then a day or two later, a truck pulls up, their crew brings the food aboard, and we spend half a day storing it. All very quick and civilized. For us the jury is still out. At some point a combination of factors will tip the scales towards carrying a crew member. When this does occur, it will be for cleaning, maintenance, watching the boat when we are away, and prepping before we return. Having an extra set of hands in high latitudes will also influence us. But for now, we stay as always, on our own. This entry was posted on Sunday, February 19th, 2012 at 12:31 am and is filed under Dashew Logs, Wicked FPB 97. Both comments and pings are currently closed. To most recreational boaters, your vessels are large. I’m wondering what you would consider to be the entrance requirements for ownership of one of your vessels, assuming that it would be owner operated? Listening to comments from your various “tour” videos, and reading your writeups, I get the sense that many of your purchasers are coming either from other larger passagemakers, e.g., Nordhavns, or like yourselves from ocean going sailboats. And of course you provide significant vessel specific training as part of the deal. But what about someone who hasn’t had significant experience on the water? Are there some criteria that could be used to determine if they are ready to take on the challenge? Implied in this is the question of what should one do to meet the criteria. This is an interesting question and one we have not had before, since it usually takes someone with ocean going experience to appreciate the way we do things. My short answer is that regardless of the boat type, the training and practice will be the same. There are books to be read, courses to take, and chartering will help. The one aspect I’d emphasize is getting a basic understanding of weather forecasting and analysis. Of all the skills, this is the one which will pay the biggest dividends. I recently had this discussion with a potential buyer who was considering the FPB 64, but had never owned more than a small ski/fish boat (under 30ft/9m). He was curious how appropriate the FPB yachts might be. From my perspective, for it’s size and amenities, the FPB’s are particularly attractive for those with less experience. If you have to learn to handle a boat – why not handle one as easy to handle for it’s size as an FPB? If you need to maintain systems – why not buy a vessel that has gear specifically selected for proven use and minimal maintenance, with ease of maintenance and service built in to the design? If you need to learn how to handle wind, waves, current, underwater hazards, and the weather in general – why not buy a boat that is ruggedly built out of forgiving aluminum, not as sensitive to docking or piloting errors, and provides all the offshore safety features of the FPBs? If you desire to have hands-on training and guidance on how to understand and use your boat – wouldn’t you want to buy one that comes with an experienced passage-maker spending the necessary time helping you learn and understand the details? Are the FPB’s a perfect boat for the beginner or the seasoned passage-makers? I can argue strongly for both. Thanks for your responses Steve and Todd. Steve, I think you are correct in that anyone who has not had ocean experience would probably not appreciate a lot of what you folks put into the FPBs. As a somewhat experienced BC/PNW coast cruiser, I and many of my ilk have never been offshore, but can certainly appreciate a good tool for the job when we see it. So Steve I think your comment re understanding weather forecasting and analysis, when I think about it, really sums up what fundamentally differentiates the coastal cruising requirements from the offshore requirements. That and mechanical breakdown – at sea you HAVE to be able to do the basic repairs. On the coast we can easily experience 10-12′ short seas, do night runs, etc, that are small scale versions of your offshore adventures (I think!). But will generally have good near term forecasts and close by safe harbours. Anyway, thanks guys for the wealth of info that you are providing here. If you would like to talk with someone who is also not a ocean voyager, but who, with an excellent crew, brought SARAH-SARAH (FPB 64-2) back to the Pacific NW, I’d be happy to relate my decision to purchase this boat. Found an old email from 2006 and found out you are still cruising !! Do you ever get close to Australia ? I would like to catch up with you some time. I am now 87 and on July 4th I will be two fat ladies, 88. I am still working in private practice My health is 100%…must be all that sea-time in WWII and later on PaganLee. I cruised around Taiwan, Hong Kong and spent 3 years in Okinawa, got married to a Filipino in Cebu, Philippines and we have a daughter. We came back to Australia in 1988. Have had a remarkable 25 years in Melbourne but will leave that for a later date. Hope this email finds you somehow, somewhere, sometime. Nice to hear from you after all these years. We are well. Stay in touch. Note for SetSailors – Dixie was a WWll coast watcher in the Solomon Islands. We met him in Rabaul, New Guinea, together with his large family. This is detailed in Offshore Cruising Encyclopedia together with the story of how he rescued his boat from the clutches of a PNG reef. Many nice anchorages in the Pacific Northwest require one to take a line ashore as, if crowded or small,the spot may demand that the boat not swing. Fotunately my wife is 16 years my junior and quite fit besides, so the requirement has been met for a crew member with agility and strength to do the job. It is, admittedly safer and less stressful to have a third person aboard for this maneuver. This is because, as the shoreline pays out from it’s spool, one person should monitor this (to make certain no tangles interfere with it’s deployment and no chance of too much slack getting around the rudder or prop). With just the two of us, we depend on our wonderfully large Rocna anchor. Having set and backed down, which locates us relative to the distance ashore, I move to the swim step monitoring the shoreline deployment while the engine is still in reverse. If Brian is with us, he simply swims ashore with the line in his teeth!? Many sailors are complaining about the poor quality of their anchor, even some who are famous for their average good hold. Normal if you take account of the teeth stick size things they have aboard the vessel. For the rest I fully agree, Sail at your own, the best way to stay fully independent. Putting my hand up for a crew position Steve. Thank-you for that excellent discussion of crewing levels. In my small way I agree completely, and I am usually single-handed! If you don’t mind I am going to print that out and keep it. Varies with where you are and the political pull of the pilots. For example, if you are non-US flagged and enter Puget Sound on the Washington State side, you are required to carry a pilot or PAY FOR AN EXEMPTION. When we inquired about this we were told it was a safety issue. Local Canadian yachts are sometimes exempted. But sail your 30 footer from New Zealand and you are a hazard. The other are w ith which we are familiar is Alaska, where the pilot rule starts at 20m/65 feet for foreign flag vessels. This got me thinking about where you would find these pilot requirements. The coast pilots maintained by noaa? so I googled — what a hodgepodge of ___ stuff. Came across a new law stating Washington state no longer requires a pilot on non-US flagged rec vessels under 100 ft and under 250 grosse intn’l tonnes. 100 feet pops up as a requirement in many locations but wow what a mess. I asked my father (retired Sandy Hook pilot) about all this; he stated 95% of the pilots thought there services should be for commercial ships not rec vessels but the vocal 5% usually win out with the agents and legislatures to extract more revenue. You can find Pilot Requirements Worldwide for every country/area/port in the Admiralty List Of Radio Signals (ALRS) Vol. 6 Pilot Services, Vessel Traffic Services and Port Operations. All the ALRS Volumes 1-6 are great to have on board and they get updated trough the Notices to Mariners like Admiralty Charts so you will have up to date information about recent changes ….. They are published by the United Kingdom Hydrographic Office (UKHO). Alaska requires a pilot for anything foreign-flagged over 65′? Was that, perchance, a factor in the hull length of the FPB64? Yes, and a host of other regulations that kick into effect above 20M, like being considered a ship in many parts of the world and being forced to stay in the shipping lanes. I have to say, if you ever take crew, I’ll envy the one who’s lucky enough to get the chance to learn from your experience first hand Steve. Thanks for the opportunity to learn from you. It’s a real pleasure to read your fascinating reasoning over all aspects of cruising and boat building. Yeah!!! How say? Sometime the Hazard is not at sea, but behind one desk in the dime light of one office! I hope my writing is comprehensible and without too many disrespect of Shakespeare’s language as it is not my native language, and beg your pardon if it is not!!! Yes Sir! I think all you have to do is maintain an Internet voluntary crew list. When you need one of us you just holler and give us the pick up point and we race…the first one gets the berth! Thanks for a great blog. Hello Steve. I read in your post above that you are using counter-rotation propellers on the FPB 97. Is the port prop rotating left (when view from the back) and the starboard prop rotating right – or the other way around? What would be the rational behind either way? Thank you and best regards, Markus. When viewed from astern look forward, the right hand propeller turns clockwise and the left hand prop turns anti-clockwise. Two reasons for this. First, in reverse the offset prop torque or walk is across the boat. If you want to rotate in place put the outside engine forward, the inside turn engine reverse, the boat uses both forward thrust outboard and prop walk inboard to make the tightest circle. The oher advantage is in rough water. “What would be the rational behind either way?” It seems Steve missed the other question half of this question. The use of “wrong” way, (that is, props that the tops of the props spin inwards when in forward) has to do with times when you wish to or must use one engine. Maybe one engine has failed. Maybe you wish to go slow but running both engines will requires operation below optimal RPMs, This consequent, low load operation will use excess fuel and possibly glaze the bores. By using just one engine you can overcome this low load situation and improve fuel economy, however, with conventional handed props the engine in use, by virtue of the offset (from the centreline) of the prop will tend to push you off course (using the starboard engine steers you to port and vice versa). Additionally the prop walk will further exacerbate this tendency to steer off course. FPBs with their narrow beam and long length which gives them greater directional stability might be the exception, however for most hulls, with conventional handed propellors, it can be almost impossible to operate on one engine. On the other hand, if one were to have “wrong” way spinning props then the propellor walk would negate much of the force created by the off centreline propellor and single engine operation often becomes possible. IMO these days with bow thrusters being almost ubiquitous the idea of installing “wrong” handed props has a lot of merit. The direction of prop spin is a function of maneuvering with twin engines – one forward and one reversed – and the cleanest waterflow in rough conditions on passage. Having the props turn so they are coming up to the hull towards the center/inboard side gives the best waterflow – i.e. the flow under the hull as opposed to the outside which has more turbulence. When rotating in tight quarters with engines opposed the prop on the inboard side of the turn is in reverse and walking the boat toward the outside, while the engine on the outboard side is ahead and turning the boat in similar fashion. Running on one engine has very little affect on steering. But of course there is substantial drag from the lazy prop, and if the prop is spinning something has be done to keep the gearbox lubricated.